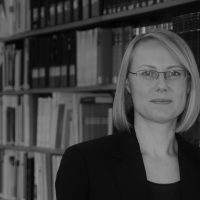 Professor Dr Elke Krahmann is chair of International Political Studies at Witten/Herdecke University, Germany. She has published widely on international security issues, including her award-winning book States, Citizens and the Privatization of Security by Cambridge University Press (2010). Her latest research project examined the use of private security companies by the United Nations, NATO, and the European Union. As security risks dominate the 'West', the main beneficiaries are private companies who promise to protect us from "known knowns, known unknowns & unknown unknowns".